Spain’s benchmark index, the IBEX 35, falls more than 2% on the day. 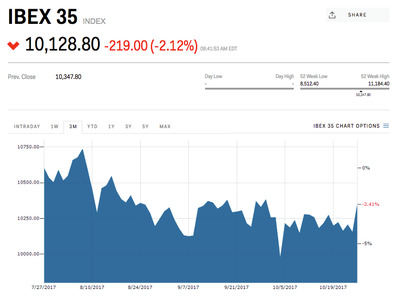 LONDON — Stocks in Spain have dropped sharply on Friday afternoon after Catalonia’s parliament declared independence from the rest of the country. Lawmakers in the regional parliament in Barcelona voted to become a sovereign independent state against Spain’s wishes. Carme Forcadell, the president of the parliament, also asked the EU to recognise Catalonia as a sovereign nation. It came as Spain’s prime minister asked the Senate to approve Article 155, which would allow the government to take control over Catalonia. The vote led to a big fall in Spain’s benchmark IBEX 35 share index, which dropped to a loss of more than 2% on the day shortly after the vote, hitting a low of around 10,130 points. Elsewhere, market reaction to the vote has so far been subdued, with the euro virtually unmoved on the declaration. Prior to the vote it was around 0.45% lower, and 20 or so minutes after, is just over 0.5% down.